Adrian Blake Enscoe and Sydney Shepherd in Billy and the Killers. Photo by Shira Friedman. BOTTOM LINE: Teenage angst, crime mystery, and the commonality of dark minds all combine in Jim Shankman and Peter Stopschinski's new rock musical. Alt rock has an innate quality of angst, from the gripping albeit imperfect voice of Kurt Cobain, to the more recent material by Kevin Morby and the like. The songs, more often than not about dark matters, are like a secret language for outsiders. Jim Shankman’s musical Billy and the Killers fits in the same category. The downstairs space of HERE Arts Center is transformed into a grungy garage, framed by the barred cells of a prison. With the live musicians and captivating music that set the evening off to a heart-pumping start, I feel like I should have gotten pink or blue streaks in my hair before attending this show that feels more like an alt-rock concert than a typical musical. Billy (a very earnest Adrian Blake Enscoe) is the stereotypically dark and sensitive singer-songwriter who wears black T-shirts with graphics that look like the album covers of death metal bands. He writes a song hoping to gain attention from the girl of his dreams, Nell (an edgy Sydney Shepherd), who comes knocking at his door, thus setting in motion a series of unfortunate events. 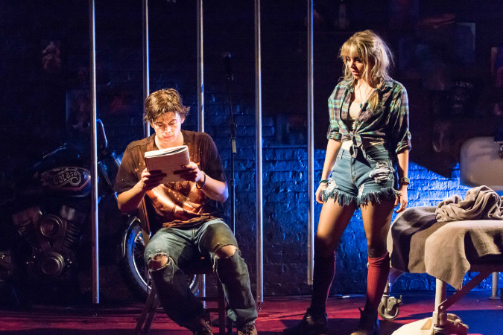 Billy and Nell, like a slightly tamer Sid and Nancy, find kindred spirits in each other: both are fascinated by death and other dark matters. Billy’s love for Nell is manifested in turning his lady into the heroine of his songs (mostly with disturbing lyrics), as well as painting her as mutilated corpses. For a pair of frustrated teenagers who have finally discovered an emotional outlet in art, perhaps the prospect of eternal separation, in its most violent form, is the most potent aphrodisiac imaginable. The creative streaks that seem to redeem and set Billy’s emotions free also become his downfall when they are used against him as evidence of a crime he didn’t commit. When Nell is discovered brutally murdered in the manner depicted in Billy’s drawings and lyrics, he is arrested as the prime suspect. In death, Nell continues to be Billy’s muse. As he laments his fate behind bars, they reprise their duets like a hard rock Dante and Beatrice. The narrative shifts back and forth, presenting itself like a jigsaw puzzle to be solved. Like any crime mystery, the truth starts to take shape as the audience gets clues through the revelation of secrets, sometimes unsavory ones, by various characters. The moments between Billy and his father (the seasoned Tom O'Keefe) are among the many heartwarming highlights of the show. Although the plot is at times forcefully convenient, and I found myself struggling to connect the songs to the development of the story, Billy and the Killers does manage to communicate a message: the artistic expression of angst, violence, and even gore can be almost medicinal. To be human is to have a dark side, and to have self-control is to function in a society without acting out that aggression. In a sense, Billy and the Killers suggests that violence and angst, channeled through art, can make us feel less alone. Billy and the Killers has book and lyrics by Jim Shankman, and music by Peter Stopschinski. Directed by Craig J. George. Set Design by Margaux Maeght. Lighting Design by Cha See. Costume Design by Glenna Ryer. Sound Design by Rafe Terrizzi. Stage Manager is Scott Winton Wray. The cast is Adrian Blake Enscoe, Sydney Shepherd, Sean McDermott, Tom O'Keefe, and Paul Sadlik.